WAIST HIGH: Factory Records Fanatic Vows To Give It All To Manchester. Factory Records Fanatic Vows To Give It All To Manchester. 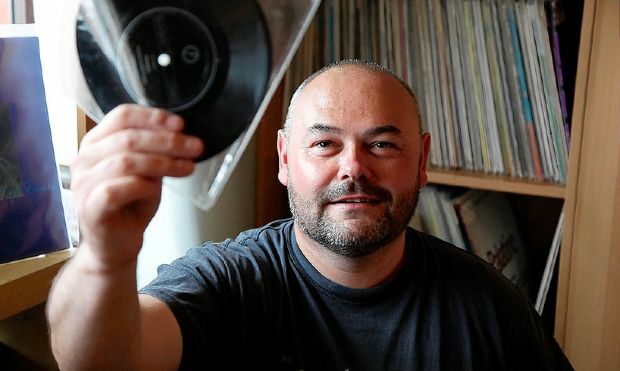 From Manchester Evening News: A music fan obsessed with cult Manchester record label Factory is planning to bequeath his collection to the people of the city. Colin Gibbins, 43, has been scouring record fairs, car boot sales and charity shops around the country to collect the 345-piece vinyl discography by 64 artists from 1979 to 1992. He is now only 48 short of collecting them all. Colin's dream is to exhibit the collection by bands such as Joy Division, New Order, Durrutti Column and Happy Mondays and he is asking other music lovers to help him reach his goal. The 43-year-old said: "I started my collection as a music fan but it has become a personal quest to get the whole set. It has been a seemingly never-ending mission. Just when I think I know exactly what I have to find, another rare version of a release pops up that I didn’t know about. "But I am confident I know what the remaining records are. I just need a little help with it now." Colin’s first experience of Factory Records was as a 13-year-old hearing "Transmission" by Joy Division. It switched him onto music in such a way he spent every spare moment of his teenage years trawling through record shops across the region looking for anything on the label. During his musical odyssey Colin has met many of those involved in Factory Records and built up a reputation for having an encyclopaedic knowledge of its history. He says, "Some people lock their collections away, but I want to see mine on display and share it with everyone. What I would love to see is my name next to the collection in a music museum. "Factory Records was one of the most influential labels in music history. It has legendary status and I want to celebrate that." Among the gaps in Colin’s collection are releases by post-punk bands Crispy Ambulance and The Wake. For a complete list of what Colin needs email him at: factorycol@sky.com.